Images that show employees of a private security firm involved in what appears to be a bombing drill confirm eyewitness reports that such an exercise was underway in the hours preceding the attack on the Boston Marathon, although authorities continue to deny that any drill took place. 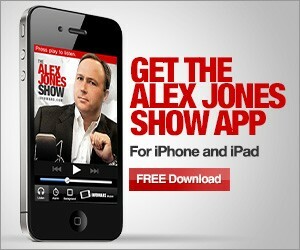 When Infowars reporter Dan Bidondi questioned the Massachusetts Governor, the Mayor of Boston, and the FBI Special Agent in charge of Boston on whether there was a bomb drill taking place on the morning of the attack, he was told that there was “no specific intelligence” regarding an attack and that no drills took place besides the usual precautions taken for a big event. The subsequent release of photos that placed the official narrative in disarray, images which showed both middle eastern and Caucasian men with large black backpacks behaving suspiciously immediately before and after the blast go to great lengths to confirm Stevenson’s story and suggest that official denials that drills took place are part of a larger cover-up. As Anthony Gucciardi has documented, two individuals identified in the images are likely to be employees of Craft International, a Blackwater-style private military/security firm. However, the media and authorities have instead focused solely on two other middle eastern looking men and ignored the presence of what appear to be current or former military professionals standing just 30 feet from the site of the explosion wearing backpacks similar to those used in the attack talking into their cellphones. Another image shows an individual dressed in the same fashion placing a black backpack on the ground in the moments after the nearby explosion. Another image shows what could be the same Caucasian man or a third identically dressed individual with a black object in his hand after the blast. 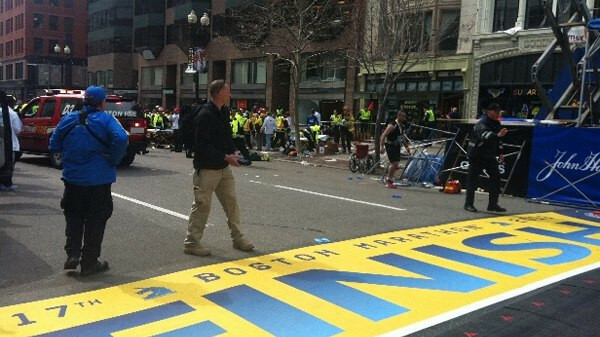 The two or three men’s behavior and demeanor in the photos clearly suggests that they are engaged in some kind of drill, which would correlate with eyewitness reports from marathon runners that bomb drills were taking place at the start of the event and that participants were told to remain calm. Immediately after the bombings, an image also emerged showing an individual walking on the roof immediately above where one of the blasts took place, again suggesting that he was taking part in a drill that paralleled the real attack. Given the fact that authorities had to cancel a press conference yesterday, which many believe was linked to the release of these images on the Internet, it must surely be only a matter of time before police are forced to admit that there were bomb drills on the day of the attack. The identity of the men pictured above and the answer as to why they were seemingly involved in a bombing drill that mirrored many aspects of the actual attack yet was denied by authorities are questions that must be answered if we are to form a complete picture of what took place. Paul Joseph Watson is the editor and writer for Infowars.com and Prison Planet.com. He is the author of Order Out Of Chaos. Watson is also a host for Infowars Nightly News.